Maybe the chicken is removing insects from the goat whilst she is catching a ride...? Too cute Leigh! Our goats have once in a great while jumped on the horses backs while they are sleeping, believe me, it doesn't last long! I feel like you need a little jingle to accompany this post. A theme song ;) Like the old speed racer song that sticks in your head. Chooks are very amusing creatures, for sure. I love the fact that ours seem to be able to get out of any enclosure but can never figure out how to get back in! I burst out laughing and am still smiling..That looks like a Barred Rock, we have two and they are quite the characters and explorers, so maybe that explains 'hitching a ride' on the goat express! hahaha! As I write this and am peering out my window, my two roosters are sitting in a wheelbarrow surveying their kingdom...the laughs never stop...RIGHT!!! is it just the one bird? Too funny!! That chicken is a highjacker! Dani, could be. The chickens are always inspecting the goats for the occasional bug or stray seed. 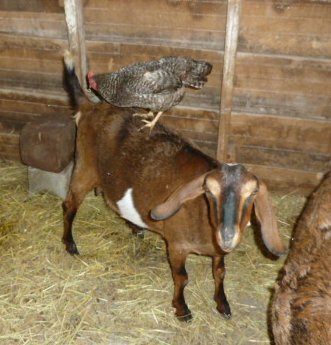 One thing that hen has figured out is that if she gets up onto a goat's back, it's easier to get over the fence! Nina, they truly are. We have escape artists too. The Ameraucanas wait until they see me coming, then run to the gate. They know I'll let them back in! Mr. H, chicken saddles! That's one I haven't heard of. Must look that up! Bettina, LOL, I thought of that too. Sherri, good guess. She's actually a Barred Holland, but few people are familiar with that breed. The Barred Hollands are very inquisitive too. Wild Thing, they know the best spots for these things! I'm impressed your two roosters get along. Renee, yup. It's all the same bird. She's very frequent at this, so it was easy to snap a few pix. APG, LOL, and the goats don't mine! Aren't animails just wonderful fun! I had a hen, Cynthia, that used to ride around on our boar hog's back...he loved her because she kept the bugs off and he kept her company (she was the one the other hens picked on). I could watch the two of them all day...that was a long time ago and I miss them both. Got the themesong from Rawhide going throug my head now. That is too adorable. And what a patient goat! Oh this is so adorable! 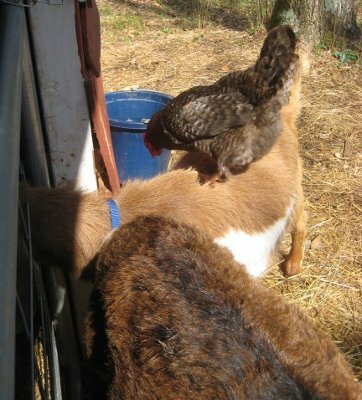 Bet the goat doesn't mind since she's getting her tail-end & back scratched by the chicken's feet!! Lynda, how funny. 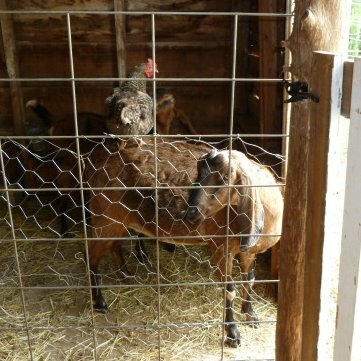 You know, our goats never seem to mind the chickens. Must be mutual! Carolyn Renee, LOL. That's a good one too. Red Hill, they all are! When that chicken hops up, they stop and stand still for her. Mama Pea, Judy, and BRF, never a dull moment with critters! HangKebon, thanks! And thank you for following mine as well. I have pictures of one of my goat kids riding the sheep (we called it sheep surfing). She would jump up when I threw hay to avoid being trampled by the mob, and eventually someone would drop hay on the back of her ride, so she could eat breakfast high and safe. It was hilarious to watch, and the sheep never seemed to mind. 5 Acres & A Dream. The dream has always been to live close to the land. The 5 acres came in 2009, when my husband Dan and I bought a neglected 1920s-built bungalow on 5 acres. The goal is simpler, sustainable, more self-reliant living, and a return to agrarian values. Click the book for more information. "It is the temptation of every civilization to turn into cash what it took nature centuries to build." Blueberries: Enough For A Pie? Herd Name - We're Official! But must declare this blog tag free. My days are just too short on time. Can organic farming feed the world? Mindset: Key to Successful Homesteading? Radio - Are You Listening? Are on right-most sidebar of my Garden Journal. Click here. How GMO Crops Conquered the U.S. Raw Milk, how safe is it? DISCLOSURE: After I published 5 Acres & A Dream The Book, I learned about Amazon Associates. I figured if Amazon was going to pay a referral fee to someone for advertising my book, why shouldn't it be me? To increase my small percentage, I have linked other books and products mentioned in various of my blog posts. However, I only link to items I use and personally recommend. Text & photos © 2009 - 2018 by Leigh Tate. All rights reserved. Simple theme. Powered by Blogger.